Bert Scott, "Adjudicated Draw?," Jamaican Ambassadors Chess Academy." At the 2003 Clarendon Open last weekend the TD made what some consider to be a few controversial decisions. One of these decisions, undoing a default after the score sheets were signed and turned in, actually determined the outcome of the Open Section. 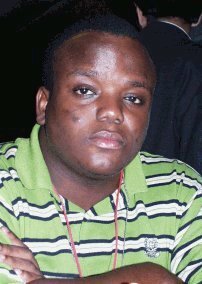 The other decision, denying a player's request for an Adjudicated Draw, while not affecting first place, resulted in the exchange of many emails from concerned Jamaican players and chess administrators. In the first instance, NM Duane Rowe arrived more than a hour late for his 4th round game against NM Shane Matthews after both players were in contention for first place. At that point Matthew was tied with NM Russel Porter for first with 2.5 points. After some discussion, Matthews, being the magnanimous person that he is, agreed or was persuaded to undo the default. The game was played, Matthews lost, Rowe finished first, and the rest as they say is history. The question on most players mine is whether it was proper for the TD to allow this course of action, or should he have asserted himself and allow the result to stand. With decisions like these, pretty soon, the argument goes, the exception will become the rule. Defaults by late arrival will become a thing of the past, and there will be no incentive for players to be punctual at tournaments. Editor's Note: In terms of the Matthews-Rowe encounter, the exact same scenario happened in the 2003 Chicago Open when 12-year old star, Kayin Barclay allowed his opponent to play the game after he forfeited. I verbally questioned the TD's ruling with Kayin's parents looking on. In the second instance in round 6, Antonne Tulloch playing Candidate Master Daren Wisdom made a request of the TD for an Adjudicated Draw at move 59 with 35 seconds left on his clock in the above position (Editor: Here the position is Diagram #1). Wisdom had 21 minutes left, but was behind in material. Was the TD correct? We welcome your two cents. Under immense time pressure, Tulloch missed 59...Re4xb4 which would have certainly add potency to his claim for an Adjudicated Draw. 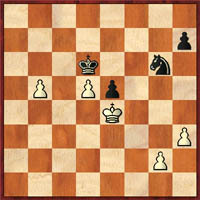 60.Rxe5 dxe5 61.Ke4 Kf7 62.a4 Ke7 63.b5 axb5 64.axb5 Kd6. 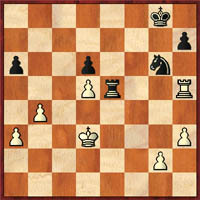 Here, Tulloch renewed his request with fumes remaining on his clock, but is alleged to have been told by the TD that as long as his opponent had material enough to mate there could be no draw. Play on, the TD is rumored to have instructed the players, much to the surprise of the wide-eyed un-lookers. 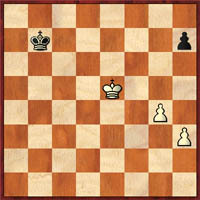 65.b6 Ne7 66.g4 Nxd5 67.b7 Kc7 68.Kxd5 Kxb7 69.Kxe5 1-0.